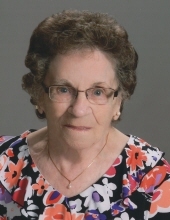 Frances Barbara Chambers, age 93, of Plymouth, passed away at home on Friday, February 8, 2019. She was born in North Dakota on March 10, 1925, daughter of the late George and Margaret (Jaeger) Schmidt. On August 24, 1952, she married Alton “Al” Chambers. The couple celebrated 60 years of marriage in 2012. Her husband preceded her in death on October 14, 2012. Frances worked as an accountant at F.W. Woolworth Co. in Milwaukee for many years until her retirement. She was a member of St. John the Baptist Catholic Church in Plymouth. Frances enjoyed baking, cooking, playing cards, but most of all spending time with her loving grandchildren and great grandchildren. Survivors include: Daughter: Margaret Ann “Peggy” (David) Klug of Cedar Grove; Three Grandchildren: Ryan Klug of Fond du Lac, Brooke (Mike) Eischen of Cedar Grove, and Brittany Klug of Milwaukee; Five Great Grandchildren: Colton, Aria, McKenna, Sawyer, and Delaney; Sister: Dorothy Tuttle of Palm Springs, CA; and Brother: Richard (Sandra) Schmidt of Tucson, AZ. She is also survived by nieces, nephews, other relatives and friends. Frances was preceded in death by: Her Husband: Alton; Grandson: Jeremy; Brothers: Leo, John, George, and Edward Schmidt; and Sisters: Helen Bassford, Evangeline Bruski, Margaret Perkuhn, and Theresa Schmidt. Following Frances’ wishes, cremation has taken place. A Memorial Mass will be held on Friday (February 15, 2019) at 6:00 P.M. at St. John the Baptist Catholic Church in Plymouth. Father Philip Reifenberg, Pastor of the Church will officiate. Inurnment will be in the St. Mary’s Catholic Cemetery in Cascade. Visitation will take place at CHURCH on Friday (Feb. 15) from 4:00 P.M. until the time of Mass. In lieu of flowers, a memorial fund is being established to say masses in Frances’ name. The family would like to send a special thanks to the wonderful staff from Aurora Medical Center and Home Care for the care and compassion given to Frances. To send flowers or a remembrance gift to the family of Frances B. Chambers, please visit our Tribute Store. "Email Address" would like to share the life celebration of Frances B. Chambers. Click on the "link" to go to share a favorite memory or leave a condolence message for the family.